Bathing more frequently for these dogs will remove the natural secretions of skin cells and hair root follicles that keep the skin and coat healthy and protect from viruses and bacteria. Although, using conditioners will help it stills removes essential oils from the skin. 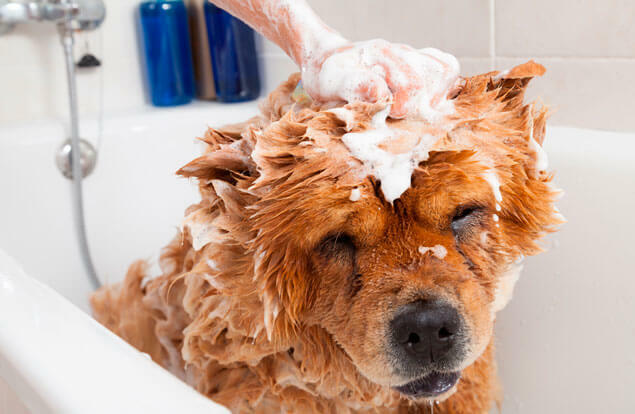 And it is important to use shampoos and conditioners specially made for dogs. Why? Skin pH The outer protective skin layer of dogs is slightly alkaline while the outer layer of human skin is acidic. Acidity is measured on a 0-14 point scale with 0 being highly acidic and 14 highly alkaline or basic. A pH of 7 is considered neutral. Dogs need shampoos and conditioners that are neutral acid (7.0) or slightly alkaline (7.5). This agrees with their skin’s normal pH and promotes skin health. Dogs with skin problems have different bathing needs than normal dogs. Due to allergies, infections or immune-mediated conditions (the body’s own immune system attacks the skin as if it were fighting an infection), these dogs need the topical therapy to treat the condition. Medicated shampoos for skin disease are specially formulated to treat the condition yet maintain the natural function of the skin. Generally these shampoos are only available from a veterinarian. Often they contain medications or chemicals that some owners prefer not to use on their dogs. Fortunately, there are natural alternatives with essential oils available that can achieve the same results. These alternatives often maintain skin and coat quality better than the commercial veterinary products.